Pope Francis’ encyclical on the environment is being translated into multiple languages and will be published probably in June. Here are five things to look for in the new encyclical. The encyclical will accept the scientific consensus that global warming is happening and that it is due to human activity. 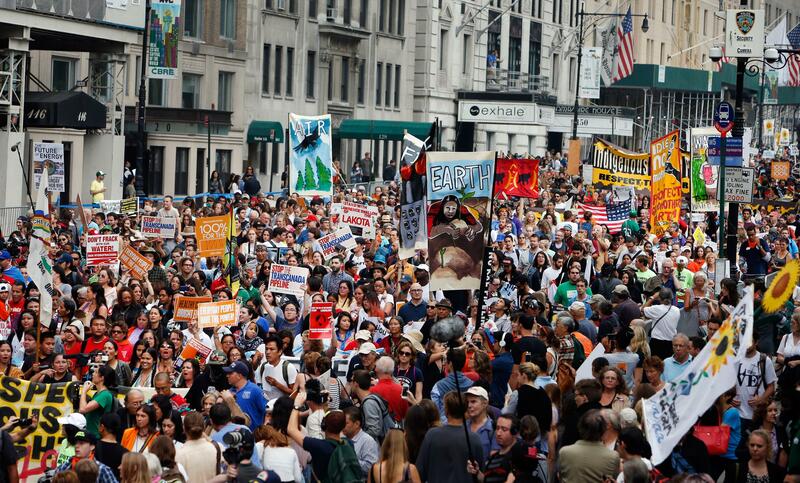 The People’s Climate March in August 2014 in NYC. A number of papal critics have already attacked this point of the encyclical, noting that popes are not infallible when it comes to science. This is, of course, true, but it is ironic that the church is being attacked for agreeing with science after centuries of being accused of ignoring science. Galileo must be turning over in his grave. It is also ironic that this is the first pope in history to have a scientific education. He was trained as a chemist and worked as a chemist before entering the seminary. He has more scientific training than most of his critics….